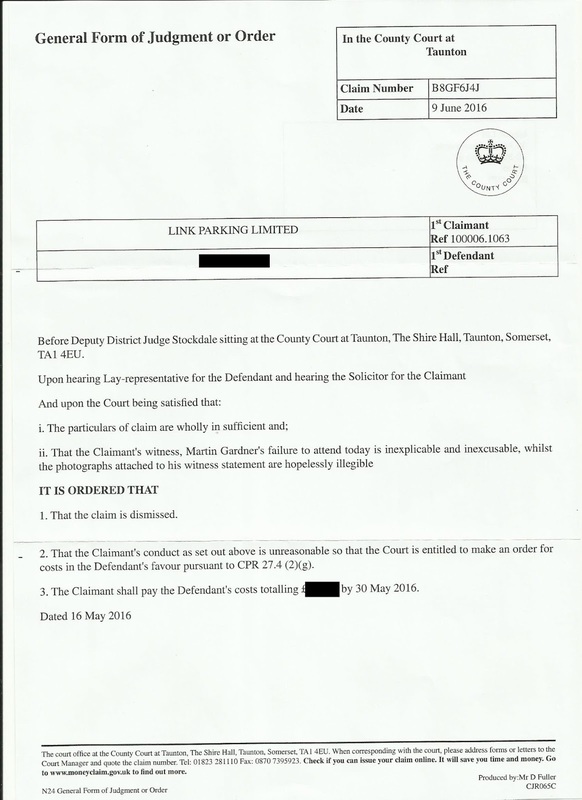 Incompetent bunglers Gladstones Solicitors have lost yet another case for Link Parking. The Prankster previously reported on this case here. The judgment has now arrived for this case. In this debacle the judge ruled that the particulars of claim prepared by Gladstones Solicitors were 'wholly insufficient'. 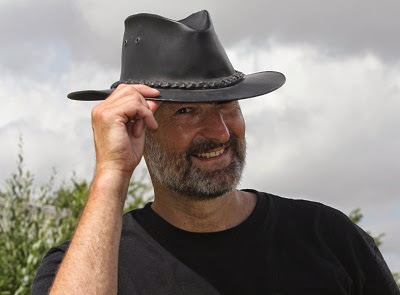 The Prankster has spoken to Gladstones Solicitors who confirm they do no due diligence before filing a claim and just file whatever comes in from the client. Gladstones Solicitors claim that it would not be cost effective to actually do any work. The Prankster believes that it is fine for businesses to look for legitimate ways to cut costs, but this is not the first time that a Gladstones Solicitors case has been thrown out by a judge for useless particulars of claim. The Prankster believes that Gladstones Solicitors are falling woefully short of their duty of care to their clients in their bid to run a cheap as chips operation. Despite doing virtually no work, Gladstones Solicitors still had the cheek to ask for solicitors filing costs of £50. The defendant, M. Ltd, suspecting this was bogus, put Link Parking on the spot by asking if Gladstones had actually billed £50 for their work. Link Parking refused to answer the question, instead stating that they paid the invoices that Gladstones Solicitors send to them. The Prankster considers that this is not good enough. If Gladstones Solicitors are only charging their clients, say, £25 to file a court claim, then this should be the amount requested on the filing form. Anything else would be artificially boosting the claim value. The filing charge is just that - a charge for filing a claim. It should not be used to bankroll further solicitor activities such as filling in direction questionnaires, preparing witness statements or appearing as advocate at a hearing. If Gladstones Solicitors are giving wrong information to the courts about the amount they are charging their clients then The Prankster considers them to be no better than scammers. The Prankster calls on Gladstones Solicitors to come clean and admit if they are actually charging their clients less than £50 to file a claim. If they are, then The Prankster calls on them to cease the practice and refund any overcharge to their victims. The Prankster has to agree, and considers if Gladstones Solicitors are under the impression that this quality of evidence is sufficient to prove a claim, it speaks volumes as to their competence as solicitors. This latest witness statement is only one of a series of witness statement blunders by Gladstones Solicitors, such as filing pictures of the wrong car park, pictures of wrong signs and inconclusive evidence of the right to issue charges. The judge also castigated Link Parking owner and director Martin Gardner for not bothering to turn up, sending a gun-for-hire solicitor instead. "That the claimant's witness, Martin Gardner failed to turn up in inexplicable and inexcusable." To fill in the back-story on this, normally small claim parking cases are held at the defendant's local court because the defendant is a consumer. However, as the defendant in this case was a limited company, the case would be held at the claimants local court. This was originally set by the courts as Knutsford, as Gladstones Solicitors filed the claim and this is their local court. Knowing that Gladstones Solicitors never actually send anyone to court for these cases, preferring instead to use a local hired-gun, and also knowing that Link's home court of Taunton was much closer to the defendant, it did seem rather silly to hold the case at Knutsford. M ltd therefore contacted Gladstones pointing out there was not much point in them and Martin Gardner traipsing all the way to Knutsford, and suggesting that the case was held somewhere closer to them both. Gladstones Solicitors never bothered to reply. Perhaps their cheap as chips business model means it is not worth their while replying to communications from defendants. Perhaps they had some other reason. In any case the courts saw sense and moved the claim to Taunton. It is therefore ironic that Martin Gardner never bothered to turn up at his home court. It appears from the information provided to him that Gladstones Solicitors are hopelessly incompetent bunglers, and The Prankster cannot understand why anyone would want to use their services, seeing as their business model does not allow them to fund the costs of properly investigating a claim before filing it, does not allow them to fund filing properly detailed particulars of claim, and does not allow them to fund preparing a properly checked witness statement. 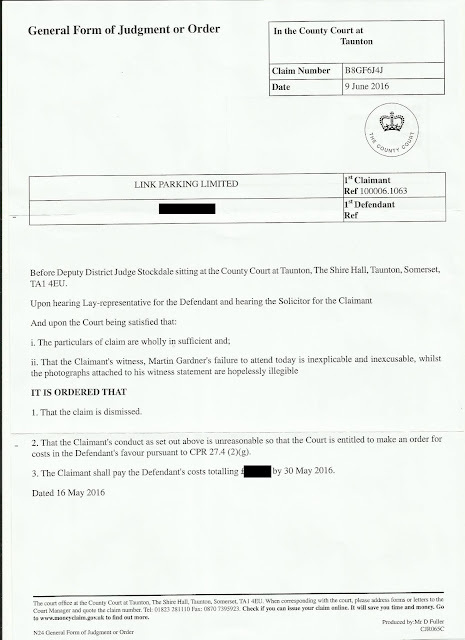 Link Parking will have paid Gladstones £50** for filing the claim, an estimated £50 for the directions questionnaire, an estimate £100 for preparing a witness statement, and perhaps £250 to the advocate who did turn up to the hearing. They will have saved money as Gladstones will have charged an estimated £0 for ignoring communications from the defendant. However, even if Link had won they would have only received £100 for the parking charge and £50 filing costs. It is obvious who the winner is here, and it is not Link Parking. The directors of Gladstones, Will Hurley and John Davies are also the directors of the IPC, who run the IAS appeals service. It is obvious to The Prankster that anyone as incompetent as Gladstones, and who appear to have such a poor knowledge of parking-related law judging by the number of cases they assist in losing in court, have no business in running an appeals service. A proper appeals service should come to the same result over each case as a court would arrive at - not some judgment relying on the bizarre interpretations of Will Hurley and John Davies, and their hand-picket motley crew of Baristas. The Prankster therefore calls on the government to take control of this scurrilous situation, and to set up a proper independent appeals service. Never mind their client, Gladstones and their baristas-for-hire are failing in their duty to the court. I'd like to hear more talk of toothbrushes being brought. How can Gladstone's MD's run the IPC and IAS appeal service? If they reject your appeal they then make money off the fee's in where they take you to court on behalf of the claim they did not accept. This is a clear conflict of interest and could be deemed as racketeering - How can they lawfully get away with this? Although it is a clear conflict of interest everybody in authority puts their head in the sand and whistles loudly, thus avoiding responsibility.